(Francisco Kjolseth | The Salt Lake Tribune) Salt Lake City Mayor Jackie Biskupski reflects on the past year and looks ahead during a sit down interview in her office at the Salt Lake City and County Building on Wednesday, Dec. 20, 2017. (Trent Nelson | The Salt Lake Tribune) Salt Lake City Mayor Jackie Biskupski gives her State of the City address at East High School in Salt Lake City on Thursday Jan. 17, 2019. 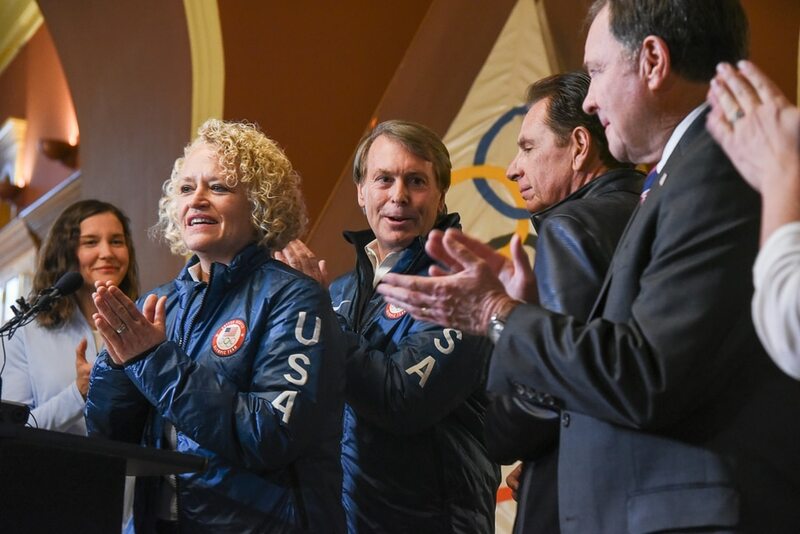 (Francisco Kjolseth | The Salt Lake Tribune) Mayor Jackie Biskupski celebrates with other Salt Lake City officials after getting the news that U.S. Olympics Committee chose Salt Lake City over Denver to bid for a future Winter Olympics, possibly 2030, as they gather at City Hall on Friday, Dec. 14, 2018, following the decision. (Rick Egan | The Salt Lake Tribune) Salt Lake City Mayor, Jackie Biskupski high-fives parade goers as she walks in the Utah Pride Parade, Sunday, June 3, 2018. (Rachel Molenda | The Salt Lake Tribune) Salt Lake City Mayor Jackie Biskupski speaks at a ceremony where she was given the Harvey Milk Civil Rights Award by the International Imperial Court at the Salt Lake City-County Building in Salt Lake City, Utah, on Friday, May 25, 2018. (Al Hartmann | The Salt Lake Tribune) Mayor Jackie Biskupski outlines next year's city budget at a press conference in Salt Lake City Monday April 30. She requested more money for more more street repairs and maintainence and more police officers on the street. (Francisco Kjolseth | The Salt Lake Tribune) Salt Lake City Mayor Jackie Biskupski reflects on the past year and looks ahead during a sit down interview in her office at the Salt Lake City and County Building on Wednesday, Dec. 20, 2017. Leah Hogsten | The Salt Lake Tribune Salt Lake City Mayor Jackie Biskupski announced Monday she will not seek re-election with her spouse Betty Iverson by her side and staff backing her. In making this decision I weighed three things, she said in her statement. My responsibility to my family, something I have fought to legally have for most of my personal and professional life. My duty to the people of Salt Lake City and to the office I hold. And, my desire to be a candidate for mayor. Biskupski, who was elected in 2015, had announced on Feb. 9 she was seeking re-election. Leah Hogsten | The Salt Lake Tribune Salt Lake City Mayor Jackie Biskupski announced Monday she will not seek re-election with her spouse Betty Iverson by her side and staff backing her. In making this decision I weighed three things, she said in her statement. My responsibility to my family, something I have fought to legally have for most of my personal and professional life. My duty to the people of Salt Lake City and to the office I hold. And, my desire to be a candidate for mayor. Biskupski, who was elected in 2015, had announced on Feb. 9 she was seeking re-election. Leah Hogsten | The Salt Lake Tribune Salt Lake City Mayor Jackie Biskupski announced Monday she will not seek re-election with her spouse Betty Iverson by her side and staff backing her. In making this decision I weighed three things, she said in her statement. My responsibility to my family, something I have fought to legally have for most of my personal and professional life. My duty to the people of Salt Lake City and to the office I hold. And, my desire to be a candidate for mayor. Biskupski, who was elected in 2015, had announced on Feb. 9 she was seeking re-election. Leah Hogsten | The Salt Lake Tribune Salt Lake City Mayor Jackie Biskupski announced Monday she will not seek re-election with her spouse Betty Iverson by her side and staff backing her. In making this decision I weighed three things, she said in her statement. My responsibility to my family, something I have fought to legally have for most of my personal and professional life. My duty to the people of Salt Lake City and to the office I hold. And, my desire to be a candidate for mayor. Biskupski, who was elected in 2015, had announced on Feb. 9 she was seeking re-election. Leah Hogsten | The Salt Lake Tribune Salt Lake City Mayor Jackie Biskupski announced Monday she will not seek re-election with her spouse Betty Iverson by her side and staff backing her. In making this decision I weighed three things, she said in her statement. My responsibility to my family, something I have fought to legally have for most of my personal and professional life. My duty to the people of Salt Lake City and to the office I hold. And, my desire to be a candidate for mayor. Biskupski, who was elected in 2015, had announced on Feb. 9 she was seeking re-election. Leah Hogsten | The Salt Lake Tribune Salt Lake City Mayor Jackie Biskupski announced Monday she will not seek re-election with her spouse Betty Iverson by her side and staff backing her. In making this decision I weighed three things, she said in her statement. My responsibility to my family, something I have fought to legally have for most of my personal and professional life. My duty to the people of Salt Lake City and to the office I hold. And, my desire to be a candidate for mayor. Biskupski, who was elected in 2015, had announced on Feb. 9 she was seeking re-election. Leah Hogsten | The Salt Lake Tribune Salt Lake City Mayor Jackie Biskupski announced Monday she will not seek re-election with her spouse Betty Iverson by her side and staff backing her. In making this decision I weighed three things, she said in her statement. My responsibility to my family, something I have fought to legally have for most of my personal and professional life. My duty to the people of Salt Lake City and to the office I hold. And, my desire to be a candidate for mayor. Biskupski, who was elected in 2015, had announced on Feb. 9 she was seeking re-election. 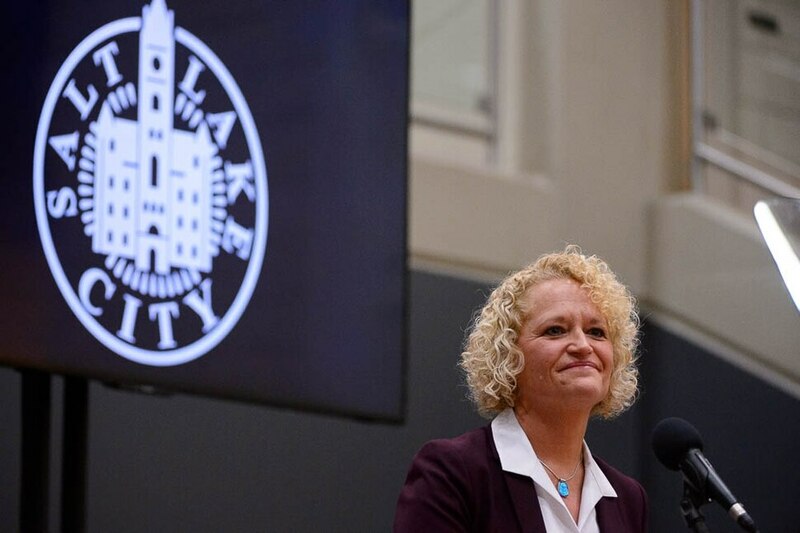 Leah Hogsten | The Salt Lake Tribune Salt Lake City Mayor Jackie Biskupski announced Monday she will not seek re-election with her spouse Betty Iverson by her side and staff backing her. In making this decision I weighed three things, she said in her statement. My responsibility to my family, something I have fought to legally have for most of my personal and professional life. My duty to the people of Salt Lake City and to the office I hold. And, my desire to be a candidate for mayor. Biskupski, who was elected in 2015, had announced on Feb. 9 she was seeking re-election. Leah Hogsten | The Salt Lake Tribune Salt Lake City Mayor Jackie Biskupski announced Monday she will not seek re-election with her spouse Betty Iverson by her side and staff backing her. In making this decision I weighed three things, she said in her statement. My responsibility to my family, something I have fought to legally have for most of my personal and professional life. My duty to the people of Salt Lake City and to the office I hold. And, my desire to be a candidate for mayor. Biskupski, who was elected in 2015, had announced on Feb. 9 she was seeking re-election. Leah Hogsten | The Salt Lake Tribune Salt Lake City Mayor Jackie Biskupski announced Monday she will not seek re-election with her spouse Betty Iverson by her side and staff backing her. “In making this decision I weighed three things, she said in her statement. My responsibility to my family — something I have fought to legally have for most of my personal and professional life. My duty to the people of Salt Lake City and to the office I hold. And, my desire to be a candidate for mayor.” Biskupski, who was elected in 2015, had announced on Feb. 9 she was seeking re-election. Leah Hogsten | The Salt Lake Tribune Salt Lake City Mayor Jackie Biskupski announced Monday she will not seek re-election with her spouse Betty Iverson by her side and staff backing her. In making this decision I weighed three things, she said in her statement. My responsibility to my family, something I have fought to legally have for most of my personal and professional life. My duty to the people of Salt Lake City and to the office I hold. And, my desire to be a candidate for mayor. Biskupski, who was elected in 2015, had announced on Feb. 9 she was seeking re-election. Citing a “serious and complex family situation,” Salt Lake City Mayor Jackie Biskupski announced Monday that she won’t run for re-election in 2019, leaving a wide-open race to fill the city’s top slot. Her surprise decision “dramatically” changes the tenor of the race, said one political scientist, and leaves a crowded field of candidates to battle it out — one of whom praised her as a “historic figure” after the announcement and all of whom wished her well. Biskupski, the city’s first openly gay mayor, had announced her decision to run again at a campaign launch just last month, vowing to fight for more affordable housing, expanded transit and improved air quality. She declined to give details on the family matter that led her to withdraw from the race but noted that it involves her children. By opting out of a re-election bid, Biskupski will become the first one-term Salt Lake City mayor in 47 years, since Jake Garn stepped down two years into his first term to successfully run for the U.S. Senate. As city staff looked on, Biskupski and her wife, Betty Iverson, held hands as they walked out to make the announcement together in front of the mayor’s office in City Hall. The couple have been married since 2016 and have two adopted sons together: a 9-year-old and a 14-year-old. Even with Biskupski’s departure, the candidate field for Salt Lake City mayor remains crowded. It includes former state Sen. Jim Dabakis; Latino businessman David Ibarra; David Garbett, the former executive director of the Pioneer Park Coalition; and former Salt Lake City Councilman Stan Penfold. Salt Lake City Downtown Community Council Chairman Christian Harrison is planning his official campaign launch Wednesday, while Richard Goldberger, a freelance journalist, and Aaron Johnson, a veteran and novice politician, have formed personal campaign committees. Incumbents typically have an advantage when they seek re-election, but a recent Salt Lake Tribune-Hinckley Institute of Politics poll indicated Biskupski may have been in trouble. That survey, conducted in mid-January, showed Dabakis with the support of 26 percent of respondents, leading Biskupski by 12 percentage points. When asked Monday whether factors such as recent polling had gone into her decision to exit the race, Biskupski appeared to cut off the reporter and quickly ended the news conference. Matthew Burbank, a political science professor at the University of Utah, said Biskupski’s departure “dramatically" changes the upcoming race. The mayor has faced a number of controversies since her election in 2015. She came under fire almost immediately for purging city staff when she took office, clashed with Salt Lake County and the City Council over the homeless shelter site selection and faced backlash over her decision not to take part in negotiations on the legislation creating the inland port in the westernmost part of the city. She and the City Council have often butted heads; in one of the more recent examples of the split, the council hired its own lobbyists to work on Capitol Hill during this year’s state legislative session — something that’s only happened twice in more than 20 years. In the short term, Burbank speculated the mayor’s choice to step down will probably benefit the front-runners in the race, such as Dabakis, but said it could also open up space for a lesser-known candidate to get through the primary and onto the ballot. Dabakis, who endorsed Biskupski in her 2015 campaign and then flirted himself with entering that race for a brief period of time, told The Salt Lake Tribune he was “shocked” she was stepping out of the race and called the mayor a “historic figure." Dabakis said her departure won’t change the way he campaigns or thinks about his own race. Ibarra told The Tribune that he was “looking forward to a race" with Biskupski in it, where they could engage in a robust debate on policies. While Biskupski is stepping out of the race, she said “this is not the time for goodbye." She has a number of initiatives she wants to see through during her nine months left in office and also plans to stay engaged in the debates in the mayoral race. Deeda Seed, an activist with the anti-inland port Coalition for Port Reform and a former Salt Lake City councilwoman, said Biskupski has been a “courageous leader” on this issue and hopes her successor will carry on the fight. Biskupski’s move to sue wasn’t met with enthusiasm by some members of the City Council, including Council Vice Chairman and inland port board member James Rogers, who derided it as “a campaign tactic” at the time. The mayor was resolute during her announcement but became emotional toward the end as she talked about her staff and the work they had accomplished together. She thanked those who have helped her drive policy changes, including her Cabinet members, and said some of the most rewarding parts of her career have been the opportunity to mentor and serve with women. She noted that she will continue to work on a number of initiatives that will move forward in the coming months, including new city-sponsored bus services, new homeless resource centers and efforts to replace the city’s failing roads. She also committed to launching new initiatives around education and justice courts. Biskupski said her family matters are “long term.” But even once they’re sorted out, the mayor said, she has no plans to run for office again.